Ideal for transporting and storing material within the factory or transporting material to building sites. Rubber provided on frame surfaces for maximum protection. Heavy-duty wheels allow easy maneuvering of your fully loaded cart in workshop and construction site. Fits inside standard pick-up truck. Frames can be safely placed on your truck by forklift or crane. 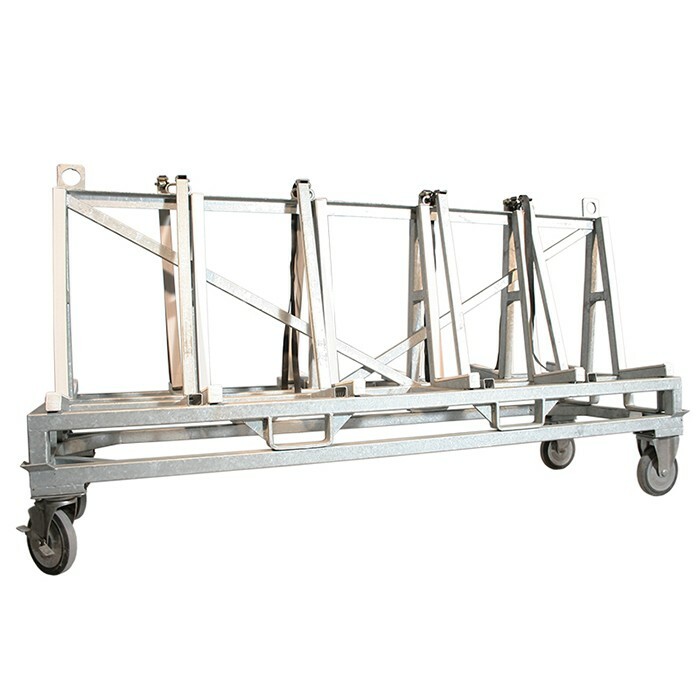 General: Ideal for transporting and storing material within the factory or transporting material to building sites. Rubber provided on frame surfaces for maximum protection. Heavy-duty wheels allow easy maneuvering of your fully loaded cart in workshop and construction site. Fits inside standard pick-up truck. Frames can be safely placed on your truck by forklift or crane. Features: Sturdy structure, designed so as to eliminate any risk of slab tipping over Slabs are placed on special rubber profiles and secured with 8 adjustable locking bars. Eight locking bars per frame mount in slotted holes on the bottom. Frame features 2 hooking points to be picked up by an overhead crane Built-in brackets on all underneath sides for forklift transport. Width of slab storage base area on each side: 212 mm Maximum load capacity: 1600 kgs. Galvanised coat finish. Frame dimensions: Length: 2350 mm. Width: 760 mm. Height: 1257 mm. Packaged Volume: 0.5070 M3. Net Weight: 177 Kgs. Gross Weight: 179 Kgs.